"What is the difference between white fillings and silver fillings?" Basically there are two types of fillings placed in most dental offices. In our office we place white fillings about 99.8% of the time. 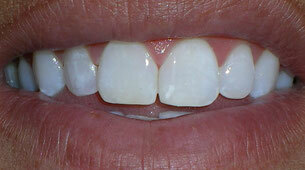 The new white filling materials are excellent and can be made to look very much like real teeth. White fillings are bonded into place with special composite bonding agents. These fillings are much more technique sensitive than the old silver-amalgam fillings. Often the dentist will use something to isolate the teeth from the saliva of the mouth (cotton rolls, rubber dams, or other devices). Once the fillings have been light cured the saliva will not cause any more problems. When these white fillings are placed with proper isolation, and with proper technique, they have been found to last just as long as the older silver fillings. One of the big concerns in the media today is the mercury content in amalgam fillings. Most of the hype is just that, hype. I understand mercury, as an element, is a known neurotoxin. The current stance and peer reviewed research says the mercury in amalgam fillings is not in a bio-available form. Therefore the body is not continuously ingesting mercury from the filling (actually most humans consume a lot of mercury in their diet, more than a mouth full of old amalgam fillings). I have some patients that have requested removal of their amalgam fillings and replacement with composite fillings. I am happy to do that. I just want to be sure my patients understand a few things before we do any treatment. 1. If they are having their fillings replaced in hopes of curing an ailment, I let them know there is no research that can prove removal of amalgam fillings will cure any ailment. 2. Removal of large amalgam fillings can result in very sensitive teeth, that may lead to the need of a root canal. 3. They are your teeth, and you can do what you want with them. We are here to help you achieve any level of health you desire. There are other options for filling materials, but the two listed above are the most durable and predictable to place.